Posted December 24th, 2011 by David Porter & filed under Social. However, none of it was ever going to be enough to meet the needs of retailing in the future. 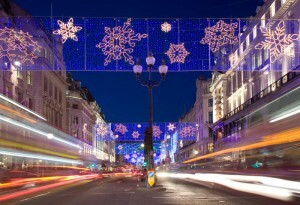 Most retailers have traditionally reckoned to do up to 80% of their annual business in the run up to Christmas. That is probably no longer so, although experts thought the hour between noon and about 1pm Christmas Eve would see the peak of retail spending. The ‘queen of retailing’ Mary Portas presented a major autumn study into retailing and the high streets. She has a vision for high streets as hearts of communities, social pulses that hold people together. It is an uphill battle given the way technology is changing the whole environment of shopping. In late November, Sean Gallagher exposed on Ars Technica how online retailers have long had the tech edge over their high street rivals, with ‘behavioural metrics’ tracking their progress through web searches and using data to target them with personalised ads. The best ‘meat-space’ shops could do was to dream up frequent-shopper offers, credit facilities and other ways ‘to persuade shoppers to give up their data’. Until now. Now some US shopping malls have started harvesting shopper data by tracking ‘the closest thing to cookies’ that human beings carry – their mobile (cell) phones. Developed by British company Path Intelligence their program called Footpath uses monitoring units littered throughout a mall sensing customer movements by triangulation from phone signal strength. That data is analysed by Path Intelligence and fed back to local retailers through a secure system. So potential customers can receive texts and alerts, even direct calls, offering the special offers. And the beauty is that with each one, a scrap more of valuable personal data goes into their database for later/repeat use and/or selling to other retailers. On 24th December, internet trade body IMRG reckoned that Christmas Day would see online spend at around £186 million as people turn away from turkey, trees, presents and relatives to search for web bargains, followed by another nearly £400 million on Boxing Day. It’s not just tapping into traditional new year sales, it’s that in this digital age, shopping is a round-the-clock/365 days activity now, and while the world of trading is cut-throat in the current economic climate, there will always be real bargains everywhere, both in real shops/malls/showrooms and virtual retail portals. So, in a year or two, will it be that the difference between the shopping modes have been virtually neutralised by technology? Time will tell, but in the meantime enjoy your festive fare, whether you bought it online, in the town centre, decided yourself or were persuaded/drawn by clever technical advertising.